Today's blog will be a brief one, as my daughter has a same day surgery procedure tomorrow and I have a lot to do today, but I read an interesting blog by Jason Mankey discussing his views on interfaith work which he ended by saying that he prefers to focus on building within the pagan community rather than working on interfaith outside it. By definition interfaith work is rooted in looking for common ground between diverse religions. Ideally it goes beyond tolerance and nurtures acceptance and the acknowledgement of commonalities. For my own part I think understanding and tolerance are the first step we need to achieve before we start working on anything more grand. With so much work left to do in even getting people to understand what reconstructionism really is, I worry about putting the cart before the horse by emphasizing the common ground we share with other groups. Interfaith of all sorts is a something I find to be very important, not only so I can learn about other traditions but so I can give a voice to mine. I see interfaith work as a chance to educate others about my beliefs and traditions, whether those others are monotheists or other pagans. The goal of education is simply to spread sound information to dispel the fear and mistrust that comes from ignorance. Whether people like what I do, or agree with it, is inconsequential to me if they can come to a place of understanding and tolerance similar to what I have for them. And I think that interfaith work, sharing what I really do and why, is essential to the long term success of the both my own community and a wider, diverse pagan community. For reconstructionists, especially, I think its vital for us to get out there and have a voice. We are a minority within the minority, often misunderstood, maligned, and mocked, and that will only change if we actively work to change it. Ignorance doesn't go away on it's own; ignorance must be changed through action, both the effort of the speaker to teach and the listener to learn. If we don't make that effort, if we don't try, and just remain within our own insular communities then nothing changes. As part of that we also have to work on being more tolerant of those we disagree with. As a follower of the traditional views about fairies, that viewpoint deserves equal time and respect too. Without a voice the old understandings are lost under the crush of new opinions and trends. And while it may be much easier to be silent, it is ultimately far more expensive. In the spirit of this, and more widely of my intent to serve my Gods and spirits, I am going to be fairly busy this year at events and conferences. I'm speaking at Connecticut Pagan Pride's Beltane event in April, at ADF's Wellspring event in May, a Morrigan retreat in Massachusetts in June, Connecticut's Pagan Pride Day in September and the Changing Times Changing Worlds conference in November. I'm excited to have so many opportunities to meet people and talk about things I'm passionate about. I often hear modern Druids saying that Druids today do not do magic, or that if we do it is not truly magic but a kind of positive thinking or aligning with nature. I find the pervasiveness of this thought interesting, especially as the ancient Druids in myth and legend were well known to wield magic of all sorts. Why have we, as modern Druids, chosen to disassociate from that aspect of our practice? The core of what I believe is based in connection to things beyond myself: Gods, spirits, the land. It is achieved through Truth, nature, and knowledge; that is seeking Truth, studying nature, and nurturing knowledge. I am an Irish reconstructionist and within that I am a Druid because that best describes the role I fulfill for my community. For a long time I also identified as a witch - I still may in some cases when I feel its appropriate, especially in the context of the way I interact with the daoine sidhe - butwhen I talk about magic I most often mean the practice of Druidic magic. I see Druidic magic as a key part of what I do and I feel confident that it is as grounded as my religion is in ancient sources and folklore. Historically we know that the ancient Irish had many distinct types of magic workers, of which Druids and witches were only two. Generally, and in broad terms, witches were those who worked baneful magic; the word for witch in Irish, bantúathaid, is related to the word túath in its meaning of wicked or perverse, going against the right order. Druids were known to be supporters of the right order and community. The Tuatha De Danann had both witches and Druids who did magic for them in the battle against the Fomorians and looking at what the Cath Maige Tuired tells us about what each group brings to the fight is enlightening. ‘Not hard to say,’ they said. ‘We will enchant the trees and the stones and the sods of the earth so that they will be a host under arms against them; and they will scatter in flight terrified and trembling.’"
As we can see each brought a different power or skill to the battle. The Druids in this case brought rosc catha, battle magic, something we also see attributed to the Morrignae. The witches bring the ability to enchant the earth against the enemy to create fear. In other myths we see Druids using wands to enchant people by changing their shape and to divine the truth of a situation. We know that they were said to use spoken magic to call up ceo draiodheachte, the druidic mist, and the feth fiada, a spell of invisibility. Druids could influence the weather, divine the future and the truth of the present, bless, curse, and create illusions. To me magic is an intrinsic part of the role of Druid and it is one I embrace. It fills the stories of Druids in myth and folklore and shapes how the ancient Druids in the stories were said to interact with their world. While witchcraft is often a personally oriented practice that has its own unique focus based in charms and spells, Druidic magic is broader and more intimately connected to understanding and manipulating the connections we have to everything around us. It is about standing in your personal power and using that power to influence things and exert your will. Magic may not be important or central to all Druids, but I think we do ourselves a disservice as a community to dismiss it entirely. There is a long and rich history of magic in Irish paganism and in the modern era that often reflects or echos older stories of Druidic magic; that reflection should be honored. Th eold stories and modern folk magic give us the root material to work with to create a viable modern approach to magic that is uniquely Irish, pagan, and Druidic. For some of us Druidic magic is essential to what we do, and that should be respected as much as the choice not to follow that path should be respected. Goibniu, or Goibhniu is the Irish God of smithcraft equated to the Welsh Gafannon. His name is derived from the word for smith; Old Irish gobha, Modern Irish gabha (O hOgain, 2006). It is said that he could forge a weapon with only three blows from his hammer (Berresford Ellis, 1987). Goibniu has two brothers, Credne the wright and Luchtne (or Luchtar) the carpenter, forming a trinity of crafting Gods. The three often work together to forge the weapons of the Gods, with each one making a part of the whole. According to the Lebor Gabala Erenn (LGE) Dian Cecht was also his brother and they were all sons of Esarg: "Goibniu and Creidne and Dian Cecht and Luichtne, the four sons of Esarg" (Macalister, 1941). Indeed the four are mentioned together at several points in the LGE such as: "In his [Nuada's] company were the craftsmen, Goibniu the smith and Creidne the wright and Luichne the carpenter and Dian Cecht the leech." (Macalister, 1941). Goibniu was the preeminent smith of the Tuatha De Danann who made weapons in particular. Before the battle of Maige Tuired Goibniu is asked what he will contribute. "And he [Lugh] asked his smith, even Goibniu, what power he wielded for them? During the battle against the Fomorians he made peerless spears that never missed and killed whoever they hit, excluding only himself. We learn the latter fact after Brighid's son by Bres, Ruadan, goes to the forge, takes one of Goibniu's spears and wounds him with it, only to have the smith turn around and kill the would be assassin with the same spear. Goibniu is taken to Dian Cecht's healing well and recovers. Goibniu had a special drink, a mead or ale called the fled Goibnenn, that conveyed the gift of youth and immortality to the Tuatha De Danann (O hOgain, 2006). This drink is sometimes called the feast of Goibniu and is said in some sources to cure disease (Monaghan, 2004). He also owned a cow who gave endless milk (O hOgain, 2006). He is also appealed to for protection in some early Irish charms which call on the art of Goibniu (O hOgain, 2006). This may relate to the idea that the being that created the weapon which caused the injury had power over the injury caused, something that we see in the charms relating to elf-shot. Goibniu is especially associated with Cork, and in particular with Aolbach (Crow Island) on Beara peninsula (O hOgain, 2006). He was said to have his forge there and to keep his magic cow in that area. Other folklore associates him with county Cavan and the Iron mountains there (Monaghan, 2004). In later Irish mythology Goibniu became Gobhan Saer, a smith and architect of the fairies (Berresford Ellis, 1987). In modern practice Goibniu is still seen as a smith God, but he also has overtones associated with the Otherworld and the sidhe, as do most of the Tuatha De. He could be called on to heal injuries caused by bladed weapons and possibly also by other weapons, and might be called on in conjunction with his two brothers by those who create with metal. I have called on him to bless weapons. Offerings to him might include beer, ale, or mead; I often offer him water, personally, as to me it makes sense to offer something cooling and refreshing to a God of the hot forge. I'll be honest with you all; when I invoke* deities in ritual or devotional offerings I almost always use extemporaneous invocations. However I've been told that invocations are challenging for many people, so I thought I'd offer a selection of different ones here for a variety of the deities I honor. You'll see pretty quickly the basic pattern I tend to use, and my approach to invocations. I'll include a half dozen here and more next time. Feel free to leave a request for a specific deity in the comments if you'd like to see an invocation for one. I remember the days, 20 years ago, 15 years ago, when spiritual devotion was an easy, flowing thing. If I wanted to stop and pray, or make an offering, or meditate on something I had the flexibility to do so. If I wanted to spontaneously drive out to a state park or to the ocean, I got in my car and went. If I was invited to attend an event or a group celebration I went. the only limitation I had was my work schedule. My focus when I prayed or conducted a ritual was to make it as perfect as possible. I had scripts to follow and high expectations. And then, ten years ago, I had my first child, and all that changed. My schedule wasn't my own anymore because there was no telling an infant to wait until I was done or finding that still meditative place in myself with a fussy toddler pulling at my hand. My previous approach to spirituality had been based around my own internal rhythms and patterns; what worked for me and when I felt pulled to do things. I had a very spontaneous spirituality, even in my set devotional work. When I planned things I had time to prep for rituals, to go over exactly what I was going to do until I was sure it could be executed perfectly. But all of that changed when children were involved. There was a time when I chaffed a bit at the feeling of restriction, especially after my second child, who has several chronic medical issues, was born. The way I did things - the way I had done things for years and years at that point - suddenly had to be completely revised. It was a challenge, to be sure, but I believed from the beginning that it was vitally important that my children be included and that what I was doing be something they could also appreciate instead of something they would see taking my attention away from them. We learned together how to form an organic approach to devotion and ritual. I had to accept that the idea of perfect prayers, recited with my full attention on worship, were right out the window; with small children you always have some small part of your attention on them and what they are doing. My offerings became more creative and also simpler, and I grew to understand that the Gods and spirits want our best efforts, but our best efforts in that moment not perfection. I re-read the Carmina Gadelica seeing it not as a simple prayer book but as a record of a living tradition practiced by people just like me, mothers praying their devotion within the daily round of feeding their families, bathing their babies, and worrying about the safety of those they loved. I learned that it was better to try than not to do at all, even if the result was comical or rushed or interrupted. My devotional work became a study in perseverance, a type of devotion in its own way. If my morning prayers are interrupted by a hungry infant I sit down and nurse him and keep right on praying. If my Lughnasa ritual falls on an especially hot day then we celebrate inside so that my younger daughter can participate too without getting sick. We adapt, we work with what we have, and we give the Gods our best effort in that moment. Because I am sure the Gods and spirits - and I know for certain my ancestors - understand about hungry babies, and sick children, about life and human limitations. My reward for adopting this approach is not only being able to continue my devotional practice no matter how chaotic my life may be on any given day, but more importantly inspiring my children to want to do what I do. My oldest daughter came to me of her own accord and asked if we could start saying my night prayers together, so now we do them as a family. They look forward to each holiday as something fun they will participate in, and they are proud to be part of the traditions we celebrate. I look back at myself 20 years ago and I see someone who was free to totally devote herself to her religion; I realize now that I still have that freedom if I choose to see my circumstances as a gift and not a burden. The dialogue response begins with Cormac describing ways that the King should act in order to uphold his own honor. The first of these is by having good geasa, or ritual taboos that are positive. This could apply to anyone who has a geis on them, if only in the way we choose to look at the ritual taboos that bind us; we can choose to see our taboos as positive or negative and how we react to them shapes their nature on some level making them either a gift or a burden. The next line advises the King to be sober, good advice since drunkenness is often a source of trouble. The King is advised to be an invader as well, which is a slightly more obscure line; however I believe that this advice pertains to ambition and the need for any person to have a healthy sense of what they can achieve. Only by pushing outward and seeking to expand can we truly achieve our own potential. The following lines suggest a good King should have good desires and be affable, telling us that people should seek to want what is best for themselves and have a friendly nature. A good King should be both humble and proud, meaning that we should be humble in knowing our own limits and admitting to our own mistakes but also proud of what we do achieve and owning our own success; only through a balance of these two can true success be found. In the same way we should be quick and steadfast, meaning we should act quickly when speed is needed but also have the stamina to stick with anything and see it through. A good King, or a good Druid, should be a poet, versed in legal lore, and wise, as well as temperate. All of these qualities should be embodied in the King, or person, for them to find the inner strength to live honorably in all these ways, because these external expressions reflect the character within. Cormac also touches on ways that a good King should interact with others, beginning with being generous, decorous, and sociable. These three features all intertwine to support each other, and to support the proper social order where the King sets the tone for the Kingdom, but it is possible for anyone else to also live by these maxims and seek to express these things as well. Along with this go other suggested actions according to Cormac, such as feeding orphans, giving good judgments, raising up the weak, quelling wrongs, and loving truth while hating falsehood, all of which can be embraced by anyone seeking to live in honor. To seek to live these qualities is to seek to live Truth and support the right order of the world. The truth of this statement is seen in the final passage where Cormac describes what will occur in the kingdom of a good King, should he follow all this advice. We see the description of a good King ruling over a fertile land, with oak trees full of acorns, fruitful earth and rivers full of fish. In the same way if we as individuals seek to embody these characteristics and live these actions then we can also bring blessings upon the world we live in. The Sacred Isle: Pre-Christian Religions in Ireland by Dáithí Ó hÓgáin - one of my personal favorites, a great look at the pagan Irish and Druids; the author does tend to look for a classical model for the Gods, so some of his ideas should be taken with a grain of salt, but overall very useful. 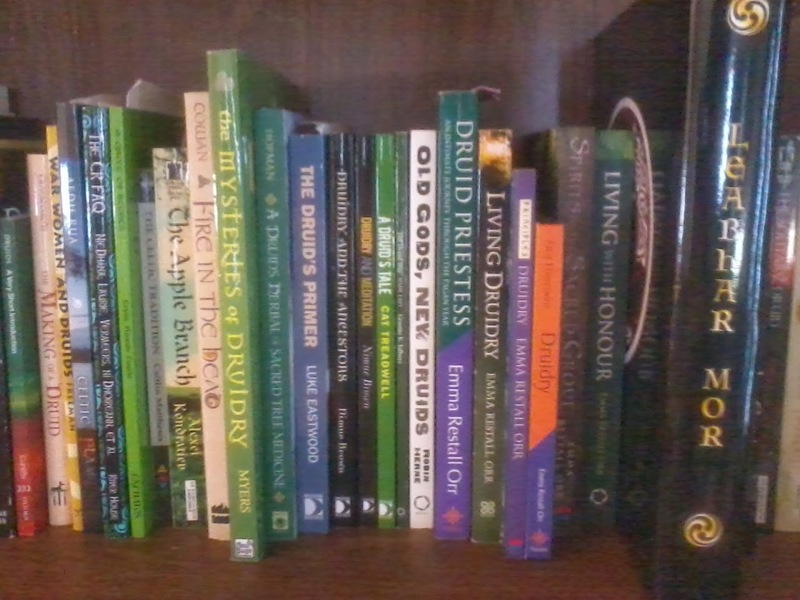 Druids Sourcebook edited by John Matthews - a collection of a variety of early and later references and articles about Druidism. The Lebor Gabala Erenn - the story of the invasions of Ireland by the Gods and spirits and eventually humans. Cath Maige Tuired - the story of the battle of the Tuatha de Danann with the Fomorians. the Year in Ireland by K. Danaher - an overview of holidays and folk practices throughout the year. I'd suggest my own books as well, but that seems a bit self serving.. This year's Imbolc was a special one for me, celebrating with the children, for two reasons. Firstly, because my oldest daughter, who is 10, has taken an active interest in participating over the past year. Secondly because I spent last Imbolc in the hospital recovering from a near fatal postpartum complication. This Imbolc I am home with my family, healthy, and have my children fully joining in with what I am doing. Life is truly good. Kevin Danaher in his book the Year in Ireland explains in detail about different Imbolc celebrations and I take some of my inspiration for practice from him. I start my holiday at sunset on January 31st, Imbolc eve, when it would have been traditional for families to prepare a big dinner, welcome Brighid in, make new Brighid's crosses, and set out a brat Brighid, Brighid's mantle, for the goddess to bless when she visited over night. In the morning omens were looked for to confirm Brighid's blessing on the home, athletic games might be enjoyed and the community would gather to celebrate. 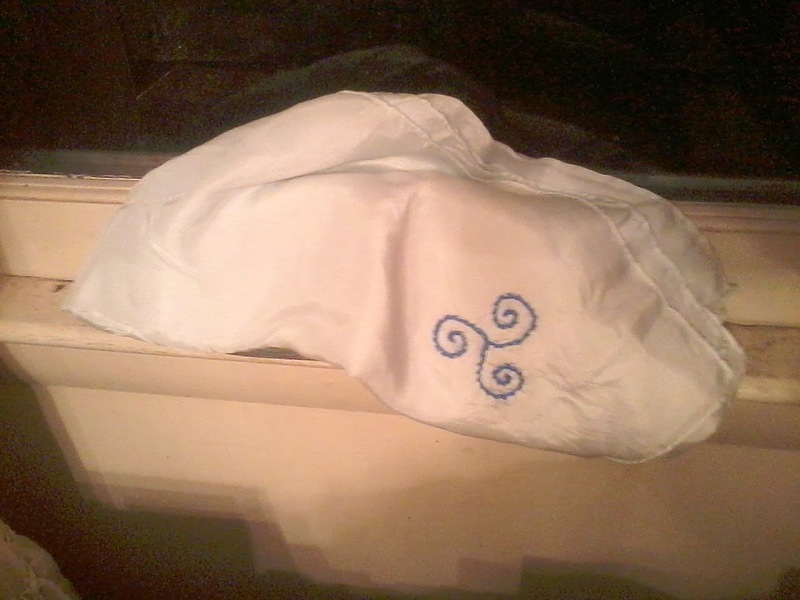 Last night we prepared the leaba Bhrighid, Brighid's bed, placing it in front of the fireplace. My oldest daughter took the Brideog (a small doll representing Brighid) outside and knocked on the door, announcing "Open the door and let blessed Brighid in"
Holding the baby I opened the door with my younger daughter at my side and we said "Welcome! Welcome! Welcome! We welcome in Brighid to our home, your bed is ready." 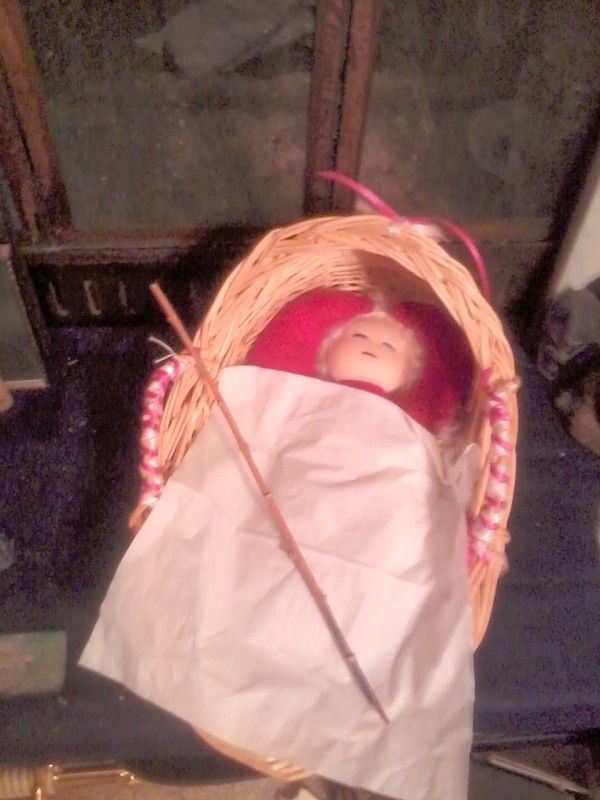 We all walked up to where the leaba Bhrighid was waiting and placed the Brideog inside, tucking her in and placing a small willow wand, the slat geal, in with the doll. The children really enjoyed the pageantry of it all and especially the signing. I told them a few stories about Brighid and who she was and we talked a little bit about her symbols and the different things, like the leaba Brighid, that we were using. After getting the Brideog set up I placed my brat Brighid out on the windowsill, and we went to bed.